I was invited to attend the first ever Disney World Social Media Moms Celebration in February of 2010 and since I love Disney, I jumped at the chance. Since our families were invited to join us at the Social Media Moms Celebration as well, I took my kids out of school for three days. That was quite a hard decision for me, but besides our normal fun at Disney World, I knew that my family would experience special Disney magic on this trip and I didn’t want them to miss it. Because my mother joined us on the trip as well, my husband was able to be an attendee like me and go to all the conference events; I was happy to share this with him and glad that he could join me. Quite awhile before the event at Disney World tweets were flying with the hashtag #DisneySMMoms and all the attendees were connecting via Twitter about what to wear, what to bring, and just general excitement about the event. This is when I absolutely love Twitter because I “met” people that I hadn’t previously been following and developed a rapport even before we met in person. A Facebook page was created with multiple discussion panels and one dad even created a Ning site for the dads to meet. Yes, this was a social media event alright! While at Disney World it was fun being with old friends that I know in real life or have met previously at other conferences while also meeting new friends. There was never a dull moment or lack of somebody to talk to; everyone was friendly and engaging. My husband, one of the few male attendees, remarked that at a predominately male conference there would never be so much chatter on an early morning bus to breakfast. Hey, we talk a lot online and it doesn’t stop in person! Our conference fee included three nights at the Polynesian and I was very excited because I had never stayed there before. It is one of the few resorts on the monorail line and that was very convenient for our families to be able to travel around Disney World while we were in the conference sessions or at media events. The hotel room was HUGE compared to the other resorts that I have stayed in (Animal Kingdom, Saratoga Springs and Riverside) and my family of 5 was very comfortable. There was plenty of space for our clothes and enough room to lounge about or for my daughter to play. We were able to watch the water parade from our balcony; my kids loved that. Since we were there for a specific event (and it was very cold), we didn’t get to experience all the hotel amenities like the beach and volcano pool, but I have a feeling that we will return to the Polynesian on another visit. Our first conference event was a breakfast with Guy Kawasaki at Epcot’s American Adventure. He was a fantastic speaker and talked to us about how he uses Twitter. His speech was both informative and engaging as he took us through the various ways to use Twitter: to sell, to search, for customer service and to gain more followers. I learned many take-away points about how to take my Twitter game to the next level. The big conference day on Friday was an all-day event at the Contemporary Resort and Conference Center. I was not a fan of the Contemporary years ago, but lately I am loving it; the decor has changed from an out-dated 70s look to more of a hip, sleek W Hotel. And you can’t beat the convenience of the monorail stopping right inside the hotel. The first speaker of the morning was Maxine Clark, Founder, Chairman and Chief Executive Bear of Build-A-Bear Workshop. Her story of a “dream” – a dream that is now a gazillion dollar business – was perfect for the location and backdrop of the Cinderella castle behind her. Our tables were decorated with Disney Princess Build-A-Bears and my daughter is still upset that I didn’t win the raffle for the bear at my table. Next up was Marissa Jaret Winokur, actress and Tony Award winner for her role as Tracy Turnblad in Hairspray. Marissa did her speech interview-style; it was funny and entertaining, but the audience mostly connected with her talking about how she juggles being the mother of a young child and her career. I think Kathy Ireland’s speech was the most surprising to us all. We knew her as a once super-model and yes, knew that that she had an extremely successful lifestyle brand and business, but didn’t know just how inspiring she is as a woman, wife and mother. This is a woman who has her priorities in order – faith, family and then business – and really tries to live her life accordingly. She has been married 22 years to an ER doctor and commercial fisherman (who knew, right?) and together they have built a personal life and business that has not been free from trouble, but that is real and true. I know that I became a fan and I would venture to say that the whole audience, including my husband and other men, did too. Chris Brogan followed Kathy Ireland and while he said it was a tough act to follow, most attendees were eagerly awaiting his moment on stage. Known in social media circles as a “rock star,” he’s an entrepreneur and New York Times best-selling author. We all knew this as he has a constant presence on Twitter and well, everywhere. What we didn’t know was just how funny he was! While he talked to us about how to make our blog posts better, more engaging, and more community-oriented, he also had us rolling in the aisles. I am breaking one of his rules now, “make blog posts shorter and more concise,” but at least I am following another rule “be helpful.” Chris was around for most of the conference days and was very accessible for questions and conversation with all the attendees. The conference ended with a very funny comedian, Mary Ellen Hooper, who had everyone in stitches about her observations both in social media and real life. Part of our time at the Social Media Moms Celebration included media press events with traditional media (print and television) as well. Our first event was at ESPN Wide World of Sport’s Milkhouse (a very nice facility with posters of athletes wearing milk moustaches). There at the Milkhouse we learned “What’s New, What’s Next” at Disney World. One exciting thing that I have to come back for is “Summer Nightastic,” which includes the return of the Main Street Electrical Parade. Just watching the video clip brought tears to my eyes as it is my most favorite thing at Disney, and currently it is only shown at Disneyland in California. Other fun events of “Summer Nightastic” include new drop sequences for Tower of Terror (I won’t be riding that–once is enough), a special fireworks show and the return of Sounds Like Summer concert series to Epcot. The Disney Cruise Line has some big things in store for the next few years; in 2010 the Disney Magic will sail to Europe for a 5-month season and in 2011 the Disney Wonder will sail for the first time to Alaska. I’m not a fan of cruising, but I think that Disney can entice me to try one of their cruises because they look like so much fun as well as luxurious (I’m all about luxury on vacation). However, I think that I will be the only one in my family to try the AquaDuck, a water roller coaster that goes out over the water, on the new Disney Dream. Disney World is about to undergo the largest expansion in Magic Kingdom history, a three-year construction project to expand Fantasyland. When it’s done, the expansion promises to make Fantasyland even more magical than it is now. Each Disney princess will have her own village for an immersive encounter, there will be a new ride with Ariel and friends and the classic Dumbo’s Flying Circus will expand to twice it’s current size as a brand new circus-themed attraction. Two new themed restaurants, Be Our Guest and Gaston’s Tavern will provide fun culinary experiences. I’m really looking forward to the new Fantasyland! The other media event we attended was a ceremony at Epcot’s World Showplace honoring volunteer families from around the world as part of Disney’s Give A Day, Get A Disney Day. Just 6 weeks into the program 600,000 people have committed to or completed their volunteer activity – this is more than halfway to Disney’s goal of 1 million volunteers. It was a thrill for me to see Kermit The Frog because I’m a big Sesame Street fan, but most of the audience loved Ty Pennington from Extreme Makeover: Home Edition. He urged the audience to shout with him “move those balloons!” to reveal the Guinness World Record-certified world’s largest canned food sculpture–more than 115,000 cans. Later that day there was a volunteer event to dismantle the sculpture and pack the canned food into boxes for distribution to food shelters. I know from past Disney media events that I have attended that Laura Spencer, Social Media Manager and Leanne Jakubowski, Director of Social Media, do everything first class, so really I didn’t expect anything less than what was presented. Disney as a company is impressive in their execution of excellence, but it’s the customer service that makes Disney stand apart from similar experiences. From the bus drivers to the cast members who held the flashing light to always point us in the right direction, we were always taken care of. When it was cold outside, we were given hand-warmers and heaters. When it was dark, we were given flashlights. When it was raining, we were given umbrellas. Our comfort, safety and enjoyment were always the first priority of the cast members; I don’t think we could have asked for a better experience. 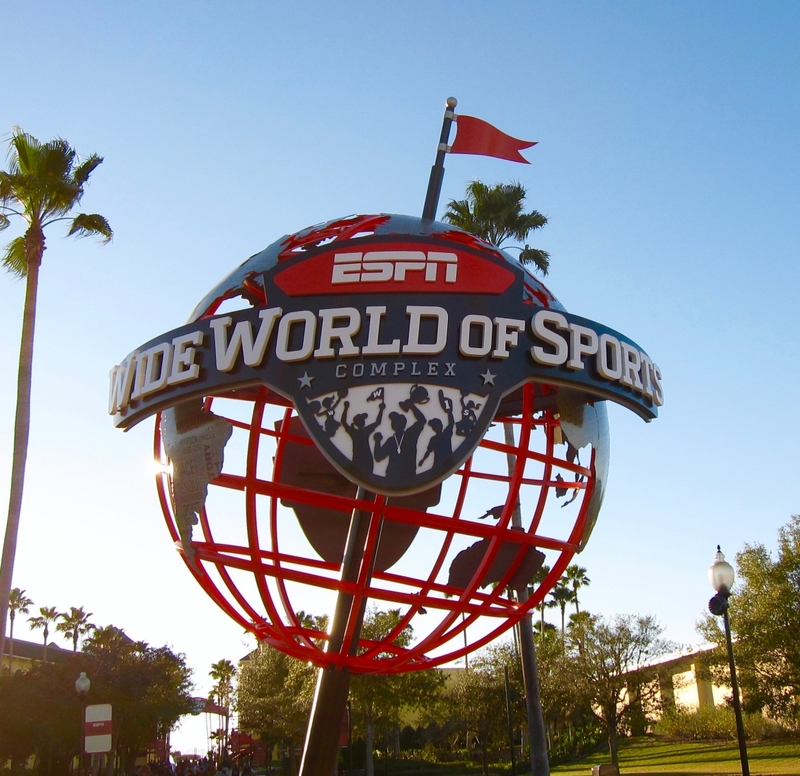 Wednesday night was our first event at ESPN Wide World of Sports and WOW, it was fabulous. The characters, dressed in sports gear, visited all the tables for photos. The food was tail-gate fare (originally supposed to be served outside, but it was too cold) of burgers, hot dogs, make-your-own nachos, sausages and beer cheese soup. Cracker Jacks and peanuts decorated the tables. My daughter went wild for the display of cotton candy. It was a really fun event and set the mood for all the fun yet to come. Thursday night’s event was held outside at Epcot’s Future World and it was cold, but hand warmers and heaters kept us warm. The food was prepared by – surprise! – Chef Robert Irvine from Food Network’s Dinner Impossible. We had tasty little dishes inspired by the Disney Princesses; my favorites were the seafood shepherd’s pie (with lobster and scallops) and the cheesecake push-pops. My daughter is a huge fan of this show and was so excited when Chef Irvine briefly took the stage to explain his dishes; we can’t wait to see the show when it airs on Food Network sometime in the spring. After dinner we were treated to a concert by a new band, Allstar Weekend, winners of Disney’s Next Big Thing contest, before the big stars Joe Jonas and Demi Lovato took the stage. The concert ended with fireworks. It was a great ending to a fun day spent at Epcot. Our last dinner party on Friday night was held after hours at Hollywood Studios. Originally the event was supposed to be on the set of Lights! Motor! Action!, but the rainy day forced the dinner inside. Characters were present to dance with the kids while we dined on a buffet dinner. But after dinner was when the fun really began because we had Toy Story Mania, one of the most popular rides at Disney World and easily a two hour wait in line, ALL TO OURSELVES! My kids were so excited and even I entered the building screaming. We ran in, grabbed our glasses and rode over and over again trying to beat our high scores, because guess what? We could; there was no wait! It was so much fun! Across from the ride Buzz, Woody, Jessie and Bullseye were waiting just for us, to take photos and interact with the kids (and adults too, I was excited to see them!). This was such a fun way to end the conference; as you can see from the photos, we had a blast. Chris & James battled; Chris won. Ahh, the goodies; Disney gave freely and it was all good. We got a big bag ‘o goodies when we checked-in: watches, a game kit, a blanket, a laptop bag and my favorite, a desktop box of post-it notes. What can I say; I like post-it notes! During the conference we were given cute pink polar fleece jackets which really came in handy due to the cold weather, but also useful for identifying each other in the parks after the conference was over. We also left the conference with a plush Mickey doll and a red sequined Mickey bag – both which my daughter took as her own. Our conference fee included 7 day park hopper tickets, with add-ons like the water parks, miniature golf and Disney Quest. While we didn’t use the water parks because it was too cold, my mom took my kids to Disney Quest on Friday while I was at the conference because it rained all day. Having the park hopper tickets was fantastic and we did use them for the two days that we stayed after the conference as well; I wish that we would have been able to take advantage of the full seven days. Yes, it is unassuming, but understand the seriousness of this little white card: this media Fastpass allowed us to NOT WAIT IN LINE for any ride that had a Fastpass, which are all the most popular rides at Disney World. Soarin‘, a 90 minute wait? Not for us; we slipped in our card and bam! Fastpass tickets came out with times stamped for that very minute. Expedition to Everest is out of Fastpasses for the day? Not for us; we still get Fastpasses! Because we never had to wait in line, I was able to talk my husband into riding all the roller coasters with me. I usually ride by myself on family trips; he hasn’t ridden with me in over 10 years, but this time he rode them all, even the super fastRock ‘n’ Roller Coaster . I even talked my kids into riding Expedition to Everest; my son loved it and my daughter still isn’t sure about how she feels. *Full Disclosure: I was invited by Disney to attend the Social Media Moms Celebration. While I did pay a fee for this opportunity, the total package of 3 nights hotel stay, meals and 7 day park tickets for my family of five was offered at a greatly reduced rate. I paid for my own transportation to Disney World and all meals and accommodations after the end of the conference days. All opinions expressed are my own. Glad you guys had a ball! .-= tami´s last blog ..Meet fashion designer Jacinta Ligon! =-. It was great meeting you there! We met at the monorail if you don’t remember after the conference at the contemporary resort. Too bad we don’t have the chance to hang out longer. Maybe @Blogher? Great recap. We were there and had a blast! Thanks for linking up at my spot today. I’ve got you on my radar now–just subscrived to your feed. .-= Anitra´s last blog ..WednesDay is FriendsDay (New followers, anyone?) =-. Love the write up… It was truly a wonderful, magical trip. Needless to say, I had a great time. One thing is for sure: they know how to throw a party! Sounds like you had an entertaining as well as informative trip. So nice that you got to bring the family along for some added pixie dust! .-= Darcie – Such The Spot´s last blog ..Wishful Thinking =-. Awesome recap as usual! It’s always fun to do Disney with you and to read about your experience after. .-= Wifey´s last blog ..Love Don’t Live Here Anymore =-. This is a great post that summarizes Disney’s fun-filled and educational conference. They did an excellent job planning and executing this event. I just uploaded 890 pictures from our trip to my computer! I should have them organized and posted by tomorrow. Wow…I wish that I would have taken more photos like you. It’s hard for me to wear my “blogger” hat and “mommy” hat at the same time at events, so I end up not taking many photos of either. That is a really good write up of the event. Honestly, I’m not sure I’ve read one quite so thorough or well written. You did a great job. Hey, we stayed a few extra days too. The kids & I stayed thru Tuesday, using my husband’s BEST WESTERN points, and ITA with every, single point you said. I really don’t like staying off site, and going from the Poly to a BW wasn’t great, plus like you–we were tired and didn’t get to the Parks at opening time like we normally do. As far as THAT aspect of the trip, it was definitely off from a normal Disney trip. Like you said, it was “okay” because of the MAGICAL fastpass, but I could live without the crowds and paying for food (we normally do the free dining plan promo)! Thanks Debbie! I have to do the free dining plan promo one time! We did the dining plan (paid) on our last family Disney trip and while I think it was too much food, it was nice not thinking about what we were spending once we were there…it felt all-inclusive. Getting to the park early is the best move…the crowds can kill the magic.